In a time when magic rules the sea, she only trusts her sword. Abbey has always been an outsider in Holdgate. While the people of her adopted city dominate the seas with their weather-controlling storm magic, she prefers the work in her father's blacksmith shop - besting any foolish enough to question her skills with a sword. But when her father is falsely accused of murder, she has to sneak aboard a stormship and take to the seas in a quest to clear his name. Teaming up with a young storm mage and a no-nonsense Captain, Abbey sets off on a swashbuckling adventure. She'll soon learn that the legendary Storm Raiders - a terrifying group of seafaring pirates - are all too real. 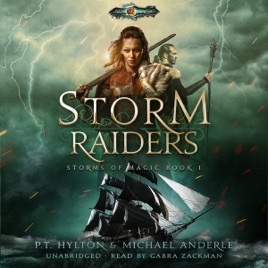 Set on the foundation laid by the Kurtherian Gambit series, Storm Raiders tells an entirely new story in the Age of Magic - and of the heroes and villains who battle for control of its destiny.